If anyone has photos that they'd like to share with the rest of the club please email them to gabe@chicagominiclub.com so we can get something online soon. Watch this space! Update: I've just been informed that the game is Sold Out! Should be a great time! It looks like we'll have giveaways from both Knauz MINI and International MINI. Remember it's much cheaper to bring your own food to grill (or simply ready to eat) before the game so feel free to bring tailgate goodies, an FRS radio (if you have one), your best MINI apparel, and a smile. This Sunday September 7th is the Chicago MINI Motoring Club Rally up to Miller Park in Milwaukee! There are only a couple of tickets left if you have not already signed up. Contact ron@chicagominiclub.com or steve@chicagominiclub.com for info. it will include our fellow motorers from the north. in the Midwest, and anyone who rides along in a MINI. Sheriffs during the game, so our MINIs will be well looked after. this event, and tickets can be purchased thru the ticket listing below. going quickly so please place your orders as soon as possible. tickets, you may reserve them by e-mailing ron@chicagominiclub.com. We will return e-mail you, same day, with confirmation and payment info. Payment will be cash or check. down, on the right side at 2400 108th street. raffling off prizes so come prepared for MINI trivia. even more fun in a MINI. Pack your boot with all your picnic goodies. Food, drink, and a mini charcoal grill to cook whatever you bring. trash disposal site everywhere on the parking areas. drive there. And of course don't forget to wear your best MINI apparel. events in the midwest this year. See you there! Saturday, August 30th, 2003 was my first day at the track. I attended Phil Wick's Driving Academy at Gateway International Speedway just north of St. Louis. Wow. I'm still blown away by it a day later. It was really an amazing experience. There was a group of about a dozen MINIs in the novice class with me, and whenever it was track time, our group went out together (with the addition of a beatiful Cobra and a couple of Miatas). The MINI is a flat out blast to drive. I couldn't really believe how well it handled and what it was capable of. It does what you want it to do, period. Sure there are some areas which could use improvement, but all in all it is a very powerful and responsive automobile. MEMO to all Mod-heads: Forget the mods for now. You don't need really need them that much on the street, and MINIs are serious beasts to be reckoned with on the track in their stock form. Save your money and spend it on track time, and especially on a good driving school. Sorry to join the herds that have said this before, but the best $200 mod for you car really *is* driving school. OK. So you twisted my arm. Yes, I really want a firmer anti-sway bar, but I'm in no hurry. And good GOD do I need some new tires. I've heard over and over again what crap the Pirellis (or Dunlops or whatever) are, and I'm now on the bandwagon for that as well. One instructor in the car with me shouted as we screeched through one turn, “These tires are PIGS!” Truer words have never been spoken. And yeah, coilovers or just lower springs would be nice, but I stress again, there ain't a whole lot of roll in these babies. They're nice right out of the box. Never underestimate ANY car, regardless of looks and personal prejudices. The car that impressed me most on the track was **drumroll please** a 2000 Honda Civic Si. Believe it. This guy was totally stealth. I saw the car in the morning, and I admit it, I dogged it a little. OK, I dogged it a lot. The guy was running what looked like a stock Civic with nice wheels and nothing else. He had the stock cat back! Well this guy was taking out M Coupes and Corvettes out on the track, and we couldn't believe our eyes. I was thinking there was a twin turbo jammed under the hood somewhere, but here are his actual mods: headers and an intake. Period. And uh, oh yeah, like $10,000 in suspension modifications, coilovers, control arms, sway bars, camber plates, freaking everything that could be done, period. The point here: you don't need massive HP numbers to haul. Suspension work is great, but the ability to drive (and this guy could DRIVE) is really the key. So that's about it. Track day rules. The Phil Wicks Driving Academy rules. People: go to the track. It will create grins that you didn't think that your face was capable of making. It will make you a better driver. It will make you love your MINI oh-so-much more. It will make you forget about your Stumble (or whatever silly nit-picky complaint you have). In short, it will make you the happiest guy or gal on earth. Tire Rack Auto-X October 4th – Save the Date! 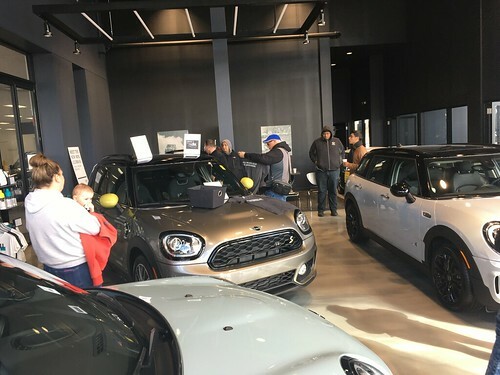 Plans are still in the works, but it is looking like we will be heading over to the Tire Rack in South Bend, Indiana for a MINI meet and some casual autocross fun.